Plot Summary: Former roller-skating delinquent Tomoe Oujima has been scouted by stunt training school Green Ship. Her romance with trainer Kazusa Himuro is cut off when she discovers that the school is secretly training assassins and guerrilla fighters. 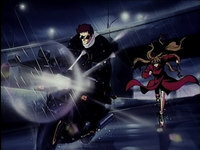 An undercover cop asks her to warn one Iori Toujou that he's being targeted. When Tomoe reluctantly escapes from Green Ship and goes to warn Toujou, she finds that he's the adopted heir of a business magnate whose family wants to get rid of him, and Himuro's organization has been hired for that job. Tomoe vows to protect Iori from Kazusa.